After committing check fraud, Preston Waters begins to live out his 12 year old fantasies by spending a million dollars in six days. But when it came to being an adult, he quickly realized that he didn't quite fit the bill. 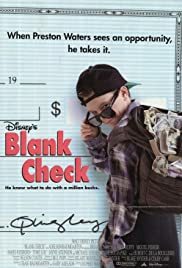 Miguel Ferrer and Brian Bonsall star in this 1994 kid classic that will leave you asking the question "why didn't this kid get grounded?" Preston Waters: When will I see you again? Shay Stanley: Why don't you give me a call in, let's say 10 years. Shay Stanley: Okay it's a date. Q: Does the castle house that Preston bought actually exist? Your cynical, money-grubbing children will LOVE it! Don't waste your kids' time with movies about dreams, building relationships with family, overcoming life's obstacles with the help of best friends, or how they can improve themselves through scholarship or sport! * how fun it is to have valuable toys and possessions, including a go-kart track in the back yard, and your own personal waterslide! * how money gets people to do anything you want! * how stealing money's OK, as long as it's from the bad guys! * be wary of gold digging women! * you CAN get away with it by lying! An official selection at the Future Corporate Leaders Film Festival, this movie will be one your kids will always cherish.